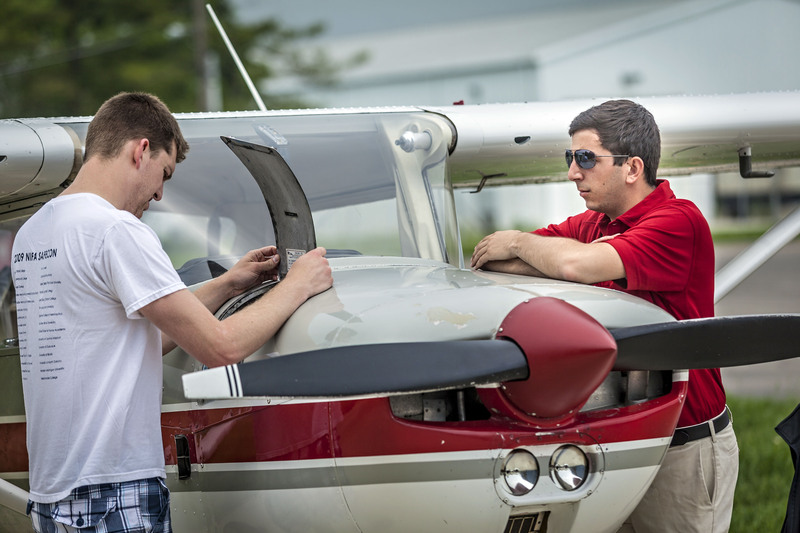 Students enrolled in the Professional Pilot Specialization complete their flight training at The Ohio State University Airport and choose the flight slots that are most compatible with their class schedule. A flight slot is either 1.5 or 2 hours long, five days a week with opportunities to fly on weekends. A student’s flight slot is held at the same time each day with the same instructor. Students who are incoming to the Professional Pilot Specialization will apply for a flight slot the semester before they intend to start training. Once their application has been reviewed, a staff member will contact them to choose a flight slot that compliments their campus course schedule. Those students who have already started their flight training with OSU will meet with the staff of the flight school in person to schedule their time slot for the following semster. The following courses are offered Fall, Spring and Summer semesters in order to fully accomodate the training needs of our students. The first course in a series of two courses that culminate in the attainment of a private pilot certificate with airplane single engine land privileges. An application and orientation process is required before enrollment. Prereq: A grade of B- or above in Aviatn 2100. Not open to students with credit for Aviation 341. The second course in a series of two courses that culminate in the attainment of a private pilot certificate with airplane single engine land privileges. Prereq: Aviatn 2101. Not open to students with credit for Aviation 342. Commercial maneuvers, cross country flying, instrument flying, introduction to complex aircraft leading to complex endorsement. Prereq: Aviatn 2100, 2101, and 2102, and permission of instructor. Instrument flight operations, navigation, patterns, maneuvers, regulations, approach protocols, and cross country flight planning and execution. Prereq: Aviatn 2100 and 2102. Concur: Aviatn 3100. Not open to students with credit for Aviation 441 or 442. Second course toward Commercial Pilot certificate single engine land. Prereq: Aviatn 2102 and 3101. Not open to students with credit for Aviation 444 or 445. Aeronautical knowledge and flight training required to attain an airplane multi engine rating in addition to the Commercial Pilot certificate. Prereq: A grade of B- or above in Aviatn 3100 and 4100, and 2501 and 3101. Not open to students with credit for Aviation 446. Aeronautical knowledge, experience and skills necessary to meet or exceed FAR Part 61 requirements for a flight instructor certificate with airplane single engine land privileges. Prereq: A grade of B- or above in Aviatn 5100. Not open to students with credit for Aviation 461. Aeronautical knowledge and flight training necessary to attain an airplane multi-engine rating in addition to the Flight Instructor ASEL certificate. Prereq: Aviatn 4301 and 5101. Not open to students with credit for Aviation 463. Necessary aeronautical knowledge, experience, and skills to meet or exceed FAR Part 61 requirements for instrument flight instructor certification. Prereq: Aviatn 5101, or Flight Instructor Certificate. Not open to students with credit for Aviation 462.